This is just a short post to acknowledge that I underestimated the snow potential for this storm. I am in good company as even the National Weather Service was in the same boat as me with a forecast of 1″-2″ for coastal sections, while inland would get 2″-6″. It turns out the heavier snowband setup closer to the coast where I have gotten reports of 3″ in Toms River to 4″ in Middletown. I know this is just adding insult to injury and I’m sorry I didn’t see this change in the storm track. Radar image as of 6:50 pm EST on 11/07/12. The radar image above shows a rather solid band of moderate to heavy snow from New York City down to southern Ocean County. This band is currently in the pivot point of the storm and will slowly start moving offshore later this evening. In the meantime, an additional 2″-3″ if certainly possible which will add to the heavy stress on the trees. After talking to my cousin Chrissi who saw a “blue flash”, it appears more power outages will be possible. The saving grace, the wind is much lower than expected. It will pick up later tonight as the storm moves away from the area, but gusts should be in the 35-45 mph range. Satellite imagery shows the surface low (red “L”) slowly pulling north-northeast this evening. 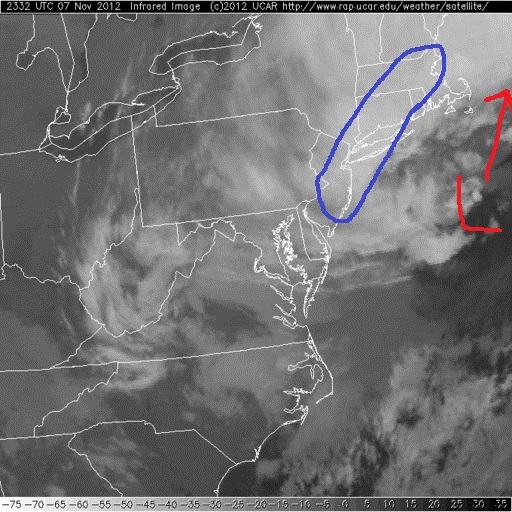 The area highlighted in blue is the area of heaviest snowfall that will slowly pivot east this evening. The good news is that temperatures warm up tomorrow, so much of this snow will melt. Just think. . .warmer temperatures in a week, possibly flirting with 70 or higher. My thoughts from yesterday are relatively unchanged. A coastal storm is looking more likely, but how close will it be to the battered coastlines of NJ to RI? This is still a tough call as we are still about 3-4 days away from the event and the disturbance is only now entering the upper-air network. This information will help to improve the model solutions and quite honestly, the models look to be in decent agreement. The Euro and UKMET models are farthest west near the Delmarva, while the GFS and Canadian models are farther east, which would still cause problems along the coast with less precipitation and wind inland. HPC Day 4 surface forecast valid on Wednesday morning. The latest Day 4 HPC forecast for surface features is above. As you can see, the forecaster feels that the more western solution is the best based on the Euro and UKMET performance of late. I actually agree with this idea with a moderate-strong coastal storm developing along the East Coast and paralleling the coast to a position just southeast of New England by Thursday morning. A period of higher winds will be possible from NC through NJ and into New England with my early best guess of 40-60 mph wind gusts and heavy rain. Snow will be possible with this system, but confined to the western edge of the precipitation shield. 06z GFS sea-level pressure and 6-hour precipitation accumulation valid Wednesday evening. 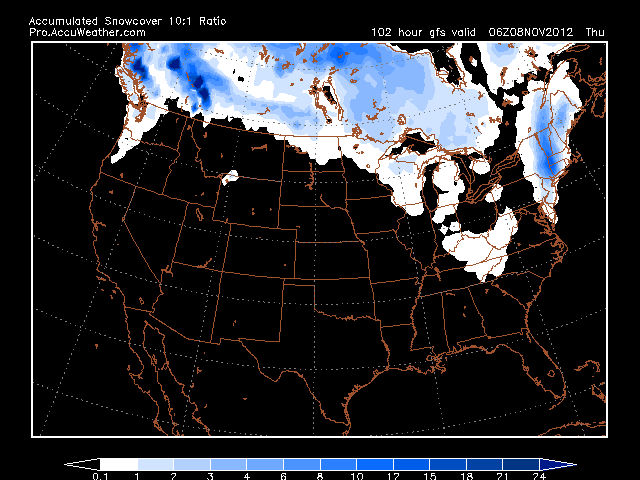 06z GFS snow accumulation for nor’easter. The two images above are from the 06z GFS which shows a modest storm off the NJ coast by Wednesday evening. The GFS does print out some snow accumulation, but mainly east of the DC/Baltimore area and confined closer to the coast. Now, the GFS is on the right side of the track guidance, while the Euro (can’t show) depicts a much different story with stronger onshore winds along the coast with heavy rain, while inland could accumulate snow. I think snow should be downplayed for now and the focus should be on potential wind and coastal flooding. Either way, the Jersey Shore and Long Island look to experience strong winds, which is something that they don’t need. My personal feeling is that we should have a good handle on this storm in the next 24 hours. I will try to post either this evening or tomorrow. Thanks for reading! I find myself stuck in a state of disbelief at what I have seen in photos and what I have heard from family and friends regarding the devastation from Sandy. Although I talked about the storm at least a week in advance, then really tried to hit the dangers hard in subsequent posts or personal correspondence, I’m at a loss for words. 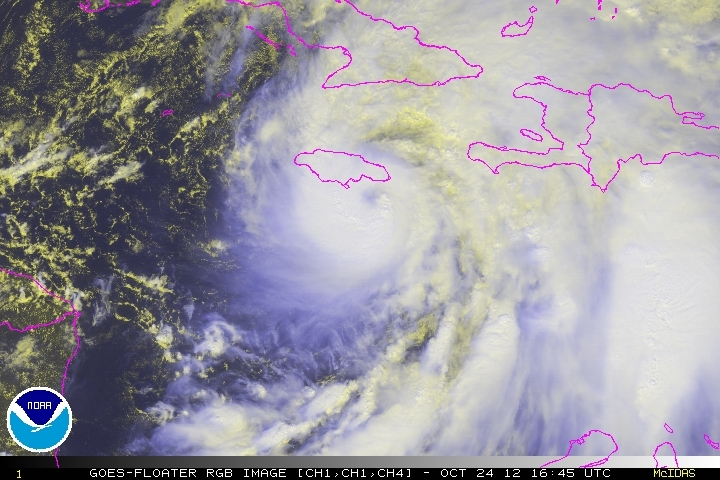 I would talk to people in NJ about the possibility that a storm like this could occur and most of the time, people would either begrudgingly agree or even scoff at the idea. On Thursday, I told my friend John (a marine biologist in coastal NJ) that if there was ever a storm that could create a new inlet in the barrier islands, this was it. Little did I know the impact of what I was saying. . . Now, there is a new inlet in Mantoloking, NJ! This is one of the many shore communities that I hold near and dear to my heart and that heart breaks seeing the ruins left behind. I love what I do and I love the weather, but I will never wish this kind of disaster on anyone. I am with you all in NJ, NYC, and beyond in spirit as we move forward. I’m just thankful that most if not all of my friends and family are safe, though shaken by this storm. A before and after picture of Mantoloking with a bridge that now goes nowhere. Ok, enough reflection and now on to the next potential storm. HPC Day 5 (Wednesday, 11/7) surface forecast issued on Friday afternoon. The Hydrometeorological Prediction Center (HPC) Day 5 forecast above for Wednesday, 11/7, shows a coastal storm moving up the Mid-Atlantic and into New England (beyond this point). Although it would be nothing compared to Sandy, the storm could deepen to 990-985 mb, which would mean more strong wind and heavy rain from NC through DC and into NJ, NYC, and Southern New England. It could also mean more snow for the mountains. Right now, I give this a 35% chance of occurring as the map above suggests. The European model which received much press shows a potent storm, while the GFS model shows a slightly weaker storm and farther offshore. I am not going to dive into specific right now, but I will monitor model trends into Sunday and will post a new blog entry tomorrow morning. I think it would be a good idea to prepare for a storm that could aggravate an already dire situation in NJ, NYC, CT, LI, and RI. Also, the disturbance that would cause this coastal storm is still off the coast of British Columbia, Canada. We have some time before the models converge on a confident solution. This will be a short post to update you on some incredible satellite imagery that is assisting forecasters today. Some of it is very new and due to some incredible hard work behind the scenes at CIMSS/SSEC University of Wisconsin-Madison and NASA SPoRT, we have these available for the blogs and some of it in operations at the Hydrometeorological Prediction Center, the Ocean Prediction Center, the NESDIS Satellite Analysis Branch, and the Hurricane Center. Thank you everyone for your help! 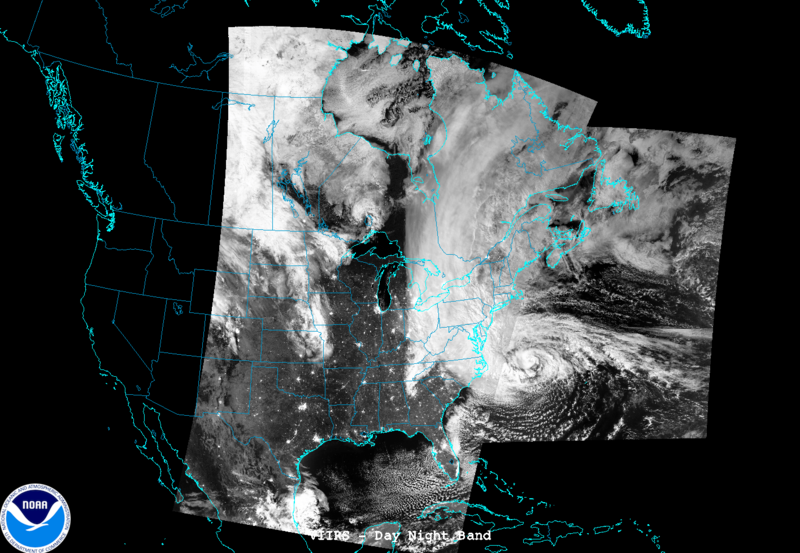 Suomi NPP VIIRS Day-Night Band (DNB) composite of Sandy courtesy of CIMSS/SSEC/University of Wisconsin-Madison valid on 10/29/12. 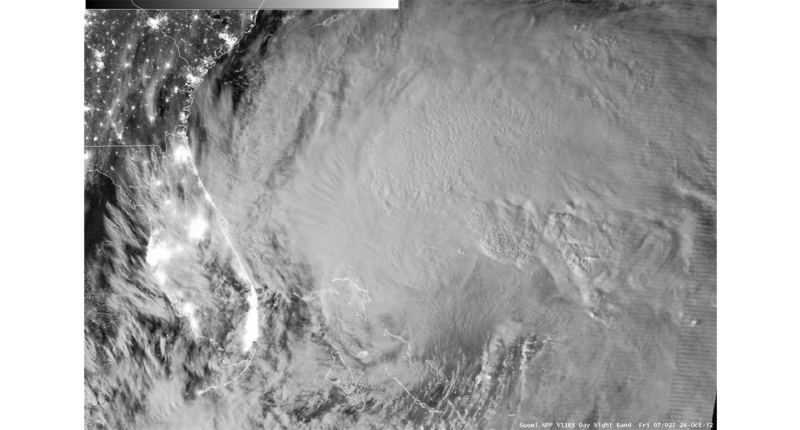 The Suomi NPP VIIRS Day-Night Band image above shows Sandy overnight with a “visible” like image thanks to our full moon. This same full moon is already aiding in the astronomical high tides on top of the storm surge and large fetch. At last report, Atlantic City is completely underwater by a few feet and chunks of boardwalk are destroyed up and down the NJ coastline. 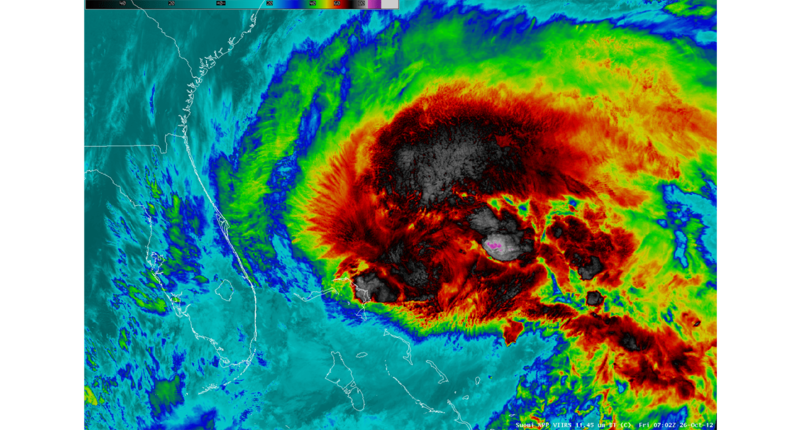 GOES-14 SRSO of Sandy on 10/29/12 with GLD-360 1-min lightning overlaid courtesy of Vaisala. Click on image to animate. The GOES-14 Super Rapid Scan Operations (SRSO) is running at the NCWCP today to assist the forecasters with 1-min imagery at 1 km resolution. 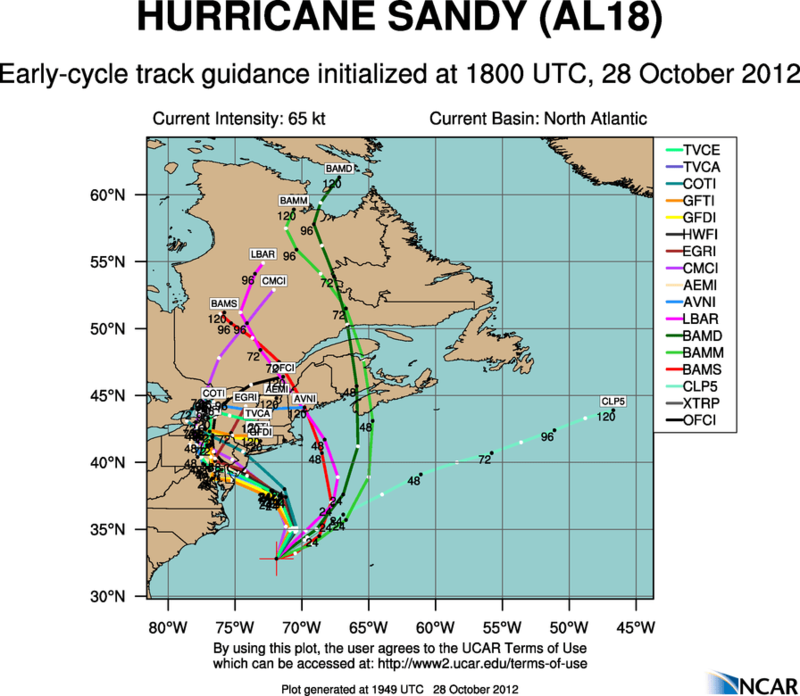 This could help HPC, OPC, and SAB look for structural changes in Sandy as she makes her approach to shore this evening. Note the complete lack of cloud-to-ground lightning in the core of the storm, while you see occasional lightning strikes in the bands hundreds of miles to the east. 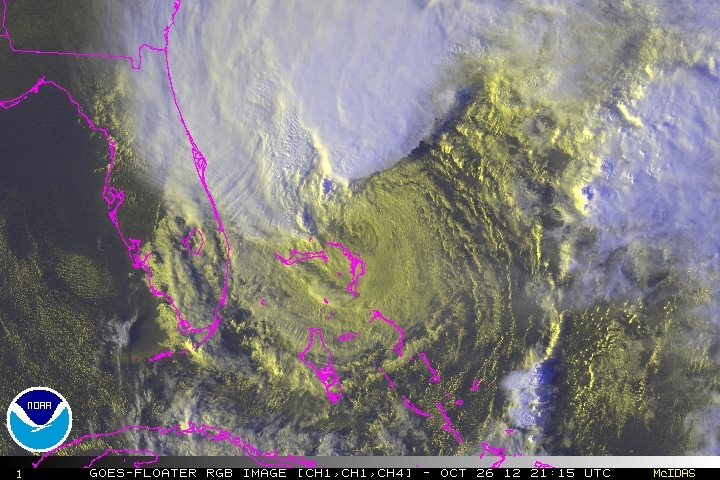 This is definitely one of the larges storms I’ve seen in my relatively short career! GOES-Sounder RGB Air Mass product valid at 15z on 10/29/12 courtesy of CIRA and NASA SPoRT. Last week I started to describe some of the upper-level features that would play a role in moving Sandy towards the East Coast. Today, the red “L” indicates the approximate location of the upper-level low that is cutting off and moving Sandy towards the coast. The black “L” is Sandy and shows the proximity. The red area highlighted shows the dry, stratospheric air on the periphery of Sandy, but notice how there is no sign of that over the hurricane? 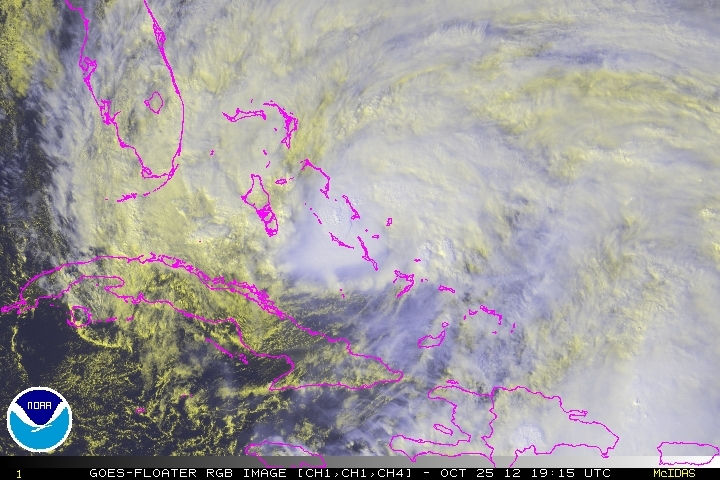 Sandy has been able to re-attain its more tropical look which has led to significant deepening and increases in wind. This tool has been used at HPC to help with the placement and timing of the features when compared to model solutions. The track guidance has not really shifted much today and it looks like a landfall will occur near or south of Atlantic City, NJ around 6-7 pm this evening. Winds have already gusted in many spots with 43 mph at my brother’s house in Toms River to 60 mph in South Seaside Park, NJ. In the Baltimore area, we have been gusting from 35-40 mph and this will only increase in all areas as the day progresses. I expect winds on the NJ shore to reach 70-75 mph sustained with gusts 95-105 mph or higher! In the Baltimore/DC area, winds will be sustained around 50 mph tonight with gusts that will probably eclipse 80 mph in spots if not higher. The heavy rain is here and I have provided a couple maps below with the rainfall and track guidance for you. Please take care of yourselves tonight and I’ll be thinking of you all. I will try to post again later if power stays on. Thanks for reading! 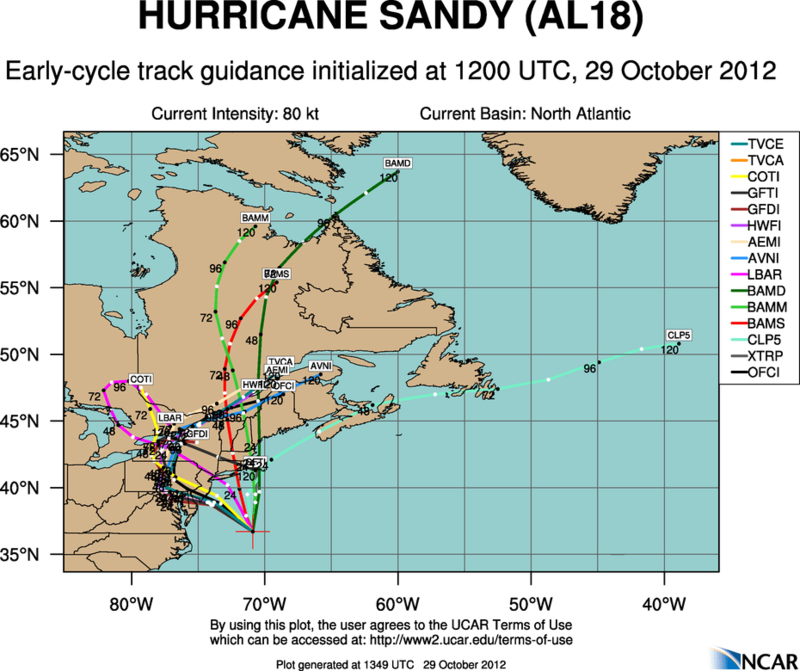 12z or 8am track guidance for Hurricane Sandy. The Hydrometeorological Prediction Center (HPC) Day 1-5 rainfall forecast valid at 11:16 am EDT on 10/29/12.